Simply beautiful and amazing. Absolutely, the best purchase I have ever made. Your product looked great on your website, but I had no idea that it would be of such a high quality until I held it in my hands. I'm now a huge fan and I can't help but purchase everything that you produce. Sounds silly, but it isn't. 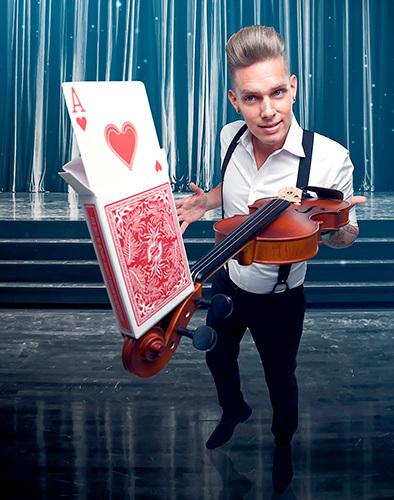 These cards are the perfect size for top performers like FISM World Champion Marc Weide or The Wonderist Chris Funk. Every magician who has handled these cards was surprised how easily he could apply all his sleights including palming. With just a few minutes of practice, you will never use "smaller" Poker cards in a Stand-Up / Parlour situation again. After being out of stock for over a year, we used the time to work on several improvements; bringing you the best quality ever available! The new Parlour Deck is the logical solution for all magicians who perform for audiences of 10 or more people (so nearly every magician). Imagine handing out a magnifying glass to every spectator. The cards are extremely visible due to their face design, without looking odd or different to your audience! The center image stays the same while the whole card size increase (about 0.5 inch in length and width) went into larger indices. NEW: Due to multiple requests, we finally have unmarked Parlour Decks available for an extremely competitive price. NEW: The Daredevil Deck! Produced in cooperation with Henry Evans, this will also be available in Parlour size, making it probably the best marked deck for stage ever. NEW: Almost all Parlour Decks will have two special gimmicks included to perform the classic 3-Card-Monte. Many specialty decks and effects already exist in this Parlour size, including Double Deckers, Ultimate Brainwave, Get Sharky, etc. 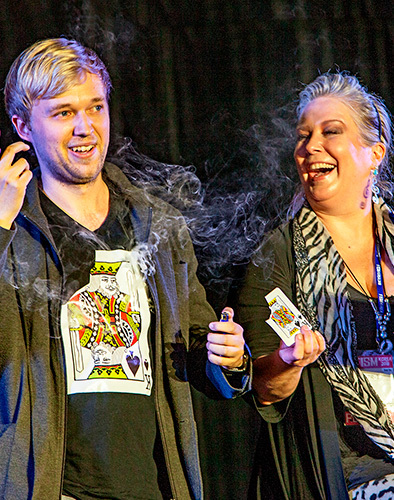 Print out the comparison chart or watch Chris Funk's performance at Masters of Illusion to find out the advantages for yourself. 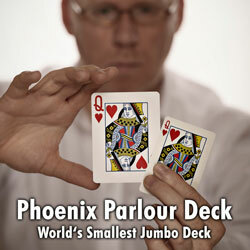 Give the Phoenix Parlour Deck a try, you will be amazed how easy they are to handle. Go to the Parlour area of our Online Shop.